Ordinarily you, like most other National Lotto or EuroMillions ticket holders, may not cherish winning the jackpot even in your wildest dreams. Nevertheless, what are most likely to do even if you for a moment consider realizing that impossible dream? Of course, you’ll exult in joy, roll all over the floor of your house in wild ecstasy, inform all your near and dear ones about your unprecedented stroke of luck, and paint the town red. 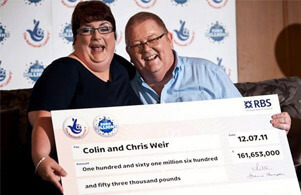 These are some of the things that Colin and Christine Weir did (maybe not exactly in that order) after the couple became the largest jackpot winners in UK lottery history on July 12, 2011. 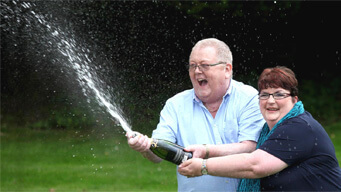 Chris and Col Weir from Largs in north Ayrshire County in Scotland were declared winners of the £161 million EuroMillions jackpot in 2011 on 12th July. The numbers on one of their Lucky Dip tickets corresponded with the numbers picked out in the draw-17, 19, 38, 42, 45, and the 2 stars 9 and 10. The landslide windfall earned them a rank in the ‘Sunday Times Rich List’ putting them ahead of many of UK’s wealthiest individuals. The Weir couple who was hush-hush about their win following the draw held on Tuesday stood to earn a whopping £5 million alone yearly in interests once the amount of £ 1, 61,653, 000 was credited to their account. Eventually, they publicized their momentous win that allowed the print, electronic, and online media a sneak peek into their fairytale, jet-set life. Celebrations for the Weirs started soon after the couple came back home following the press conference at Macdonald Inchyra Hotel in Polmont, close to Falkirk. 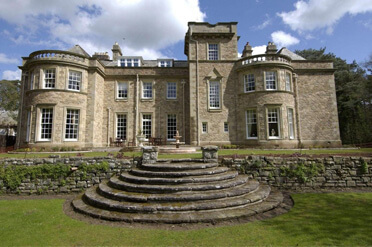 Scotland’s and UK’s largest EuroMillions winners bought a palatial mansion priced worth over £3.5 million, donated generously to charities, and bought properties for their children, besides lavishing friends and relatives with money. They went on to fund a youth association established and administered by the Patrick Thistle Football Club. Christine and Colin Weir also settled all their arrears and proceed to create a humanitarian organization-‘Weir Trust’. The philanthropic undertaking which was set up to finance Scottish charitable trusts, have already disbursed approximately £5 million since it was established. The couple has been active on the political front as well, donating largesse of more than £3 million to the Scottish National Party (SNP) and endorsing the Scottish independence plebiscite. Before their emphatic EuroMillions jackpot win, the Weir couple used to wine and dine at the local eatery at least thrice in a week splurging on an occasional Irn Bru or Coke. But once they were adjudged winners of the £161 million top purse, their lives underwent a radical shift. They now could afford to uncork champagne bottles every day, set off a chartered jet to the Bahamas, and book the Royal Penthouse Suite at ‘Hotel President Wilson’ in Geneva. Christine and Colin who’ve been happily married to each other for 3 decades went on record by iterating that they were “not scared” of unexpectedly coming into so much money. Rather they planned to live life to the fullest by doing everything the jetsetters do. And that for Colin, aged 65, meant buying his private box at ‘Camp Nou’ in Barcelona in Spain. Colin used to work as a cameraman for STV News-Scottish news service-but called it a day at his job after winning the massive purse. Christine Weir 60 was employed as a psychiatric nurse but resigned from her job, following the win. The couple wisecracked that since they were at par with David Beckham in terms of wealth, they’d try to make another baby. In the beginning they had planned to retain their £2, 00,000 home in Largs having three bedrooms and their humble Suzuki cars. Initially, they were making £7,000 everyday from their jackpot as interest in 2011 which has increased by leaps and bounds over the years. They had planned on consulting a lawyer and a financial consultant in order to manage their colossal wealth. Neighbors recall the Weirs’ only indulgence was ordering ‘takeaways’ from the ‘Fish and Chicken Bar’ in the town. They’ve two children, Jamie, 29, a call center employee (was 22 when the Weirs won the jackpot) and Carly, 31, a photography professional, would be having their personal cars and homes. Globetrotting was a priority on their ‘must-dos’ list. They were scheduling to visit ‘The Great Wall’ in China, Australia, Cambodia, and Thailand. However, the Weirs sold their ‘Knock House’ mansion in Ayrshire which they had bought for £8,50,000 within a month of their pocketing the jackpot. They bought a more luxurious manor-Frognal House-in Troon in February 2014. They are at first position of our 5 biggest winners in the UK table. Mrs. Weir remembers purchasing a total of 5 Lucky Dips coupons since the odds of winning had come down with a subsequent increase in the jackpot amount. She began rounding off the numbers that were matching but was running short of luck. However, Lady Luck smiled on her when she reached the fifth row when all the circled numbers corresponded with the ones picked up in the draw. What happened afterwards is now history. I am curious when eventually someone beats this jackpot. In the USA you can see people winning bigger jackpots all the time.